Meanwhile, I had taken leave from work, arranged for my stuff to be moved out of storage and had to begin the tedious work of unpacking. It was relentless. Ten, 11 hours a day ripping open boxes and putting things away. I know people who chuck stuff around and for months afterwards, are unable to find anything. I refuse to be one of those people. The more time I spent in my home, the more flaws I found. The new bathroom door was painted unevenly. The grouting in the bathroom and kitchen was horrendous. Some parts still are. Why did my feet turn orange when I mopped the new floor? All of this needed fixing, and time, which was running out. My kitchen countertop had to be re-made and re-installed because there was a long scratch (or something, the contractor was vague) on it. At one point, four pairs of eyes were looking at the stainless steel back splash behind the hob. Could I possibly be the only one who saw the dent at the lower left corner? That, too, had to be redone. Of course it was not all bad. I love how my home looks, if I turn off my eagle function in my eyes. The furniture gleams after restoration. I was thrilled when the drawer knife blocks I ordered online fit perfectly. For the most part, I am glad my decisions about fixtures, fabric and tiles worked out. These moments of happiness outweigh the annoyances. But they cannot possibly make up for what came just when I thought I could finally start living in my home again. It was time to reconnect the gas for cooking. A surly, monosyllabic man arrived, declared there was a leak in the pipes and said he could not reconnect the gas line. Finding the leak would have meant ripping up built-in shelves and kitchen cabinets. I had no stomach for it. I sneered at the proposed solution: bottled gas and a stove. Really? I'd have to cut the countertop and lose storage to accommodate a stove? With an oven? When I already have two wall ovens? After I calmed down from a massive fit of rage, I decided on a course of action. It benefited everyone but me. For the workers, it meant minimal remedial work. Yes, it cost the contractor a few thousand dollars but that is his problem, not mine. For me, however, it has meant changing the way I cook. I said goodbye to gas and now, am cooking on an induction hob. Those of you who use them are probably wondering - what's the big deal? To me, it's a huge deal. We are so alienated from our food - we buy meat and fish on styrofoam trays, choose from an array of plastic wrapped fruit and eat out of disposable boxes. Putting a pan or pot over controllable fire seems like the last connection to real, actual cooking. I had found what I thought was the perfect gas hob. It had five burners, including a large one in the middle, perfect for a wok. Now, I have a black induction hob with five burners in the same configuration. Remarkably, the replacement fits in the hole cut out for the gas hob. But because I live in an HDB flat, there isn't enough electrical juice to run all five at the same time. I can use two at the most. Can you feel my pain? There was more to come. Not all my cookware work on induction. I found new homes for seven well-loved pots and pans. I refuse to give up my vintage Pyrex but can only use them as serveware or in the oven. I am getting used to my new hob - how it starts off really slow and then becomes crazy hot in seconds. I've had to adjust temperatures, sliding my finger on a scale, which just feels odd to me. A little part of me dies every time I turn it on because it is so clinical and precise. No more will I write about "firing up" anything. There is no more fire. But it is pointless to look back and wax nostalgic about blue flames licking the bottom of a pot. I refuse to wallow. Onward. So this week, I give you a recipe for gyoza. They freeze well and I like to have them on hand for emergencies. Making them calms me down. All that repetitive pleating is the perfect antidote to massive rages. Because I am figuring out the induction hob, I want to try a variety of cooking methods. Gyozarequire two: steaming and frying. The dumplings go into a pan, they sizzle. Water goes in, they steam. The pan is uncovered and they sizzle again. Not all brands of gyoza skin are good. I have tried some which break or are thick and hard. But I have found two reliable ones, available frozen at Meidi-Ya supermarket. If you prefer petite gyoza, use the smaller ones, which measure 8cm in diameter. I prefer larger gyoza, made with skins measuring 10.5cm in diameter. The larger ones are easier to pleat, if you're new to this. Traditional gyoza are made with chopped up cabbage, scallions and chives in addition to meat. I have streamlined the filling to use only chives. I love the bold flavour and it stands up admirably to the ground beef filling. Gyoza is usually made with pork, and yes, please use that if you don't eat beef. Minced chicken is another option. I am using beef because I became enchanted with the beef dumplings in soup I had at a halal food court in Pasir Ris. The robust taste of those dumplings was a good surprise and so was their juiciness. If you get your beef from a butcher, have him grind some beef fat into the meat, say five to 10 per cent of the total weight. The fat adds great flavour to the dumplings, and makes them juicy. I use rendered beef fat, which you can get in tubs from Huber's, a butchery in Dempsey Road. Of course you can also use lean ground beef. I know what soulless is - I cook on an induction hob. 1. Rinse the chives under running water, pat dry with paper towels. Chop finely, place in a large mixing bowl. Grate the garlic into the bowl. Peel the ginger and grate it into the bowl. 2. Add the ground meat and the rendered fat, if using. Add 1 Tbs of the sesame oil, the Shaoxing wine and soya sauce. Mix with clean hands until all the ingredients are combined. Cook or microwave a small nugget of filling to check for seasoning, and add sesame oil, Shaoxing wine, soya sauce, ginger or garlic to taste. Mix. Grab a handful of the mixture and throw it purposefully into the bowl. Repeat until the filling is sticky. The filling can be refrigerated in a covered container overnight. 3. When ready to make the gyoza, set up a work station. 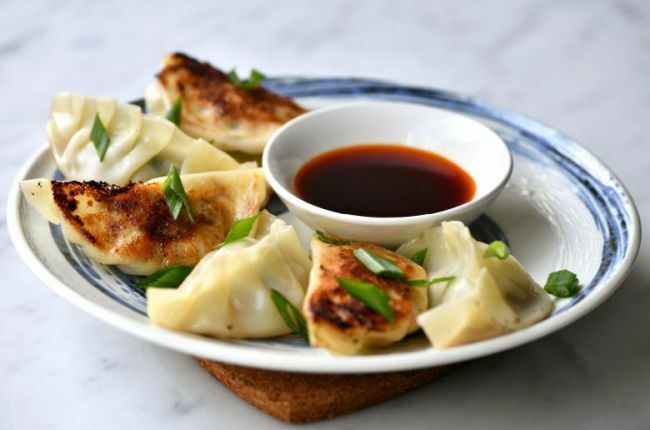 Fill a small bowl with water, place the gyoza wrappers on a plate covered loosely with plastic wrap to keep them from drying out. Have the filling on hand. Line a tray with baking paper for the finished dumplings. 4. If using large gyoza wrappers, place about 1 Tbs of filling in the middle of the wrapper. If using the smaller ones, use about 1 tsp. Wet the circumference of the wrapper with water. Fold the wrapper in half over the filling but seal only the top part. Fold the front sheet of skin onto the back sheet in a series of three or four pleats. The pleats on the right should face left, and those on the left should face right. Pinch the seams to make sure the dumpling is sealed. Place the dumpling on the tray, and continue until all the filling is used up. 5. At this point, the dumplings can be frozen and kept for about a month. If I'm making them to freeze, I use smaller trays. As I fill each tray, I cover it with plastic wrap and place it in the freezer for about 2 hours. Remove the wrap and place the frozen dumplings in resealable freezer bags. 6. If cooking immediately, make the dipping sauce. I like 2 parts rice vinegar to 1 part shoyu, with rayu to taste. Another option is equal amounts of rice vinegar and shoyu with rayu to taste. 7. To cook the dumplings, heat a large frying pan (that has a cover) over medium heat. Add the grapeseed oil and brush it over the surface of the pan. When it shimmers, line the pan with the gyoza without overcrowding. For smaller dumplings, cook for 2 to 3 minutes or until the bottoms are a light brown. The larger dumplings will take 4 to 5 minutes. 8. Add the water and cover the pan. Cook the dumplings until the water has almost evaporated. Uncover the pan and let the water evaporate completely. Drizzle the remaining 2 tsp sesame oil over the dumplings, and cook until the bottoms are browned and crisp. 10. If cooking frozen dumplings, do not thaw them. Brown them for about 2 minutes more, and steam them for 2 to 3 minutes more. Makes 20 to 22 large dumplings or 42 to 45 small dumplings.